For the first time Sweden’s central bank has cut its interest rate to a negative rate of minus 0.1 percent, and also said it will start buying Swedish government bonds to head off the risk of deflation. The central bank or Riksbank lowered its interest rate from 0 percent to minus 0.1 percent on Thursday and announced its own quantitative easing (QE) program, buying $1.2 billion in government bonds with maturities of up to five years to pump cash into the economy. “These measures and the readiness to do more at short notice underline that the Riksbank is safeguarding the role of the inflation target as a nominal anchor for price setting and wage formation,” the central bank said in a news release. Lowering its key rate the central bank expects to boost inflation and increase the country's money supply. The annual inflation rate in January stood at minus 0.3 percent. By allowing companies to borrow money very cheaply it hopes to increase investment and consumer spending, drive up inflation, while further reducing unemployment. Sweden unemployment rate rose from 7 percent to 8.4 percent in January. The Swedish economy shows positive economic growth and booming household credit growth, up 1.8 percent last year. Consumer prices in Sweden fell 0.2 percent in 2014, raising the risk of deflation and consumers delaying purchases in expectation of lower prices. “This is a policy dilemma because the Swedish credit market is performing favorably and GDP growth is above trend. 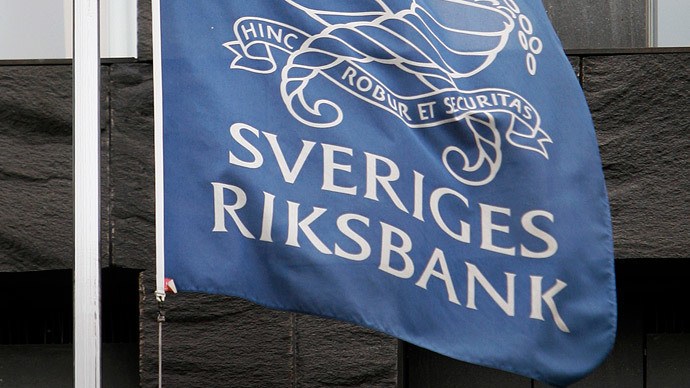 By pursuing this policy, the Riksbank is confirming that it will do anything to preserve the credibility of its inflation targeting,” the Financial Times quotes Robert Bergqvist, chief economist of SEB bank, speaking before the Riksbank’s announcement. Negative interest rates have become a feature of monetary policy in countries with weak inflation, including Denmark and Switzerland. It is the first time there has been a negative interest rate in Sweden; the Riksbank lowered its key rate from 0.25 percent to what was then a record low of zero percent in October 2014. The Swedish central bank made it clear it’s ready to cut the rate further and buy more government bonds. "Should this not be enough, we want to be very clear that we are ready to do more. If more is needed, we are ready to make monetary policy even more expansionary,” Riksbank chief Stefan Ingves said. The Swedish krona slumped by 2.1 percent to its lowest level since 2010 after the announcement.